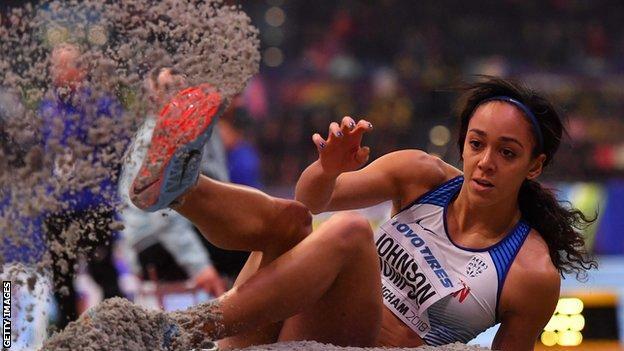 Great Britain's Katarina Johnson-Thompson claimed her first global title with victory in the pentathlon at the World Indoor Athletics Championships. The 25-year-old built on three solid events in Friday's morning session by moving into first place with 6.50m in the long jump in Birmingham. She went into the final 800m event with effectively a two-second lead over Austria's Ivona Dadic. Johnson-Thompson looked comfortable throughout and pulled clear to win. "I can't believe it," Johnson-Thompson told BBC Sport. "I've dreamed of this for so long. It's been a wobbly day but I'm happy I got the opportunity. "All my family are here which is something that never normally happens. I had a hard year at the end of the year last year so I'm so happy they got to witness it. I still can't believe it really." The Liverpool Harrier hit the front with 300 metres to go of the 800m and when Dadic threatened during the final lap, she found enough to kick clear, clocking two minutes 16.63 seconds. That result took her to 4750 points, with Dadic on 4,700 and Cuba's Yorgelis Rodriguez on 4,637.